The Singapore Sports Hub is a state-of-the-art, fully integrated sports, entertainment and lifestyle hub. Aside from its premier status as the region’s destination of choice for world-class events, it also supports Singapore’s Vision 2030 sports masterplan to forge and bond communities through sports, and ensure sports are inclusive, accessible and affordable to all. Singapore Sports Hub is on social media! Follow us on Facebook, Instagram and Twitter to keep up to date with the latest events and offerings here! An automotive festival will be held at the open-air carpark (Carpark 5) beside Leisure Park Kallang from Friday to Sunday (26 – 28 Apr). Drivers looking to park at KLP, please note that parking lots will be affected. If you have any questions, please feel free to contact our Personal Data Protection team at dpo@sportshub.com.sg. Planning a trip to the Sports Hub? Join us for a weekend of fun with friends and family at the Singapore Sports Hub, where Singapore comes to PLAY! There are activities going on in and around the vicinity of Sports Hub such as Income Eco Run 2019. Please visit the Event Time Traffic Updates page for more information. We seek your understanding for the enhanced security measures, in the interest of everyone’s safety. In 2017, there were at least 120 reports of online purchase scams involving the sale of concert tickets. The victims received fake, invalid tickets or did not receive the tickets after payments were made. • Don’t be impulsive – Be wary of online advertisements of concert/show tickets at cheap prices that sound too good to be true! Do not buy on impulse. • Don’t believe – Scammers may use a local bank account or provide a copy of a NRIC/driver’s licence to make you believe that they are genuine sellers. Do not fall for it! • Purchase tickets only from authorised sellers as far as possible. To seek scam-related advice, you may call the National Crime Prevention Council’s anti-scam helpline at 1800-722-6688 or go to www.scamalert.sg. Please note the Kids' Water Playground at Splash-N-Surf will be close​d for public for maintenance from 20 - 30 April 2019. 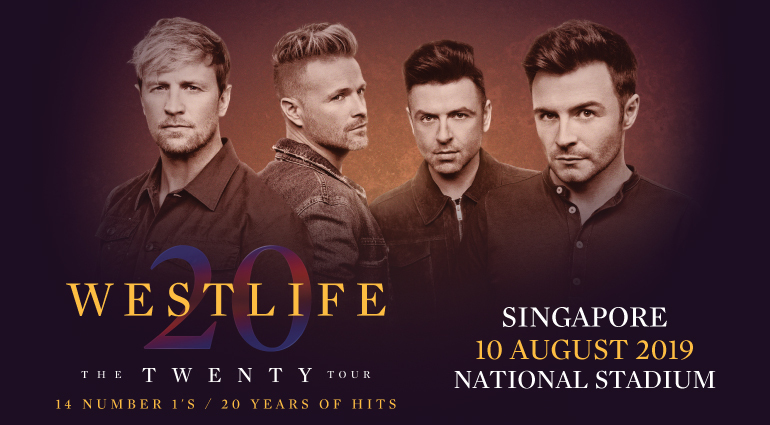 In celebration of their 20th anniversary, Westlife, one of pop music's most influential boybands, will make their grand return to Singapore on August 10, performing one night only at the National Stadium. "The Twenty Tour" is the band's fastest selling tour of all time, moving an incredible 400,000 tickets in just 48 hours in the UK. The global pop kings will perform brand new songs, alongside their greatest hits such as 'Swear It Again', 'If I Let You Go', 'Uptown Girl', 'Flying Without Wings' and 'World of Our Own'. Westlife have sold over 55 million records worldwide, and are the only band to have their first seven singles enter the UK chart at No.1. They also have the most singles of any artist to debut at No.1 in the UK. Overall, the band has had an impressive 14 No.1 singles, behind only Elvis Presley and The Beatles. They have 33 No.1 albums worldwide and as a live act have sold 5 million concert tickets. All information is correct at the time of publishing but subject to change. All prices reflected include GST and exclude booking fee. 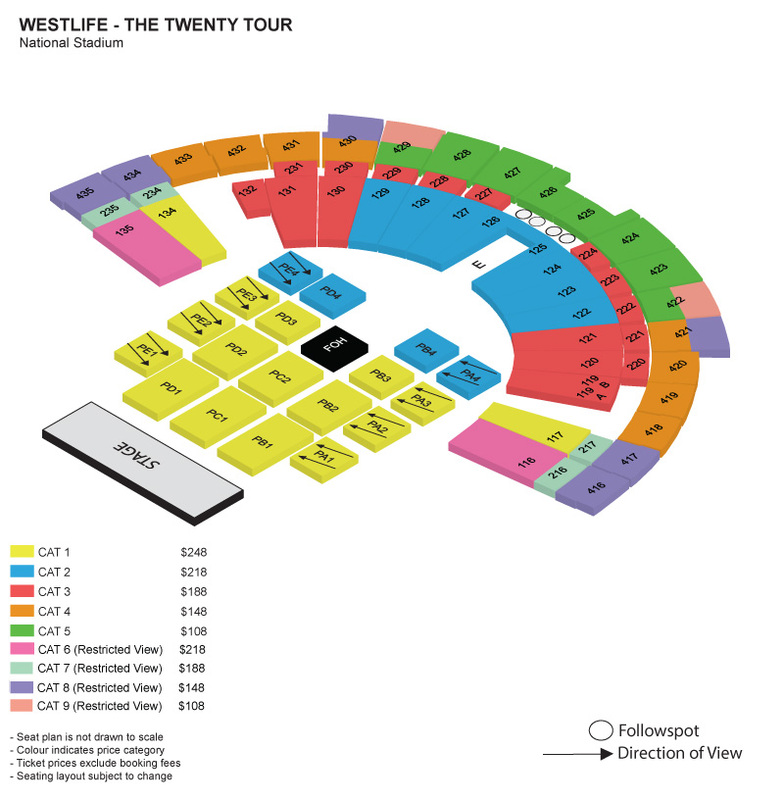 Booking fee for tickets S$30.01 and above: S$4.00 per ticket.